In this special edition of our ongoing series, “Don’t Do This,” let’s talk about the Zinwell WB616 multiswitch. You may remember the WB616 as the “go-to” multiswitch if you had 16 receivers or more and it was 2005. The good thing about the WB616 is that it lasts forever. Or so it would seem, because people today are still using them. They do break eventually, or people want to expand further, and so they ask us at Solid Signal about the WB616. It was great for its time. The WB616 let you take up to 6 satellite inputs and split them to up to 16 outputs. As I said it was very simple and reliable. However, if you’re still using this multiswitch, it’s time to move on. This is the DIRECTV SWM-30. There’s a full review of it here. It also takes six lines in, and can distribute signals to up to 26 outputs. It’s smaller and lighter and because it’s powered by its own power supply, it should keep your receivers running more efficiently. That’s not the only reason to use it. You can get 26 receivers, 13 out of each of its outputs. That’s a big jump. If you’re replacing an existing multiswitch you can just use splitters to split all the lines out at the switch. However if you’re planning new wiring then you’ll be pleased to know that you don’t need to run a line from every receiver back to the master closet. It lets you share programs. If you’re using DVRs as well as receivers, you can share programs using the same coax cable that the satellite line uses. Now, a little bit of stuff you need to know. First of all you do need relatively modern receivers. All HD receivers made after 2006 work fine. Standard definition receivers should be updated anyway so it shouldn’t bother you that they won’t work with this multiswitch. The biggest concern for some people is that there is a limit of about 150 feet of cable that can be run from the multiswitch to the receiver. With the WB616 that number was about 250 feet and you could add an amplifier. With the SWM30, amplifiers are a no-go. However, I find that a bit of planning will solve that dilemma. Because the wiring options are so flexible, you may be able to move that multiswitch to a central location or use two multiswitches. There is a “high-power” version of the SWM-30 that will give you 300 foot runs but I don’t recommend it for most folks. Installed wrong, it will fry your receivers. Once you agree that it’s time to upgrade, not replace, that WB616, you’ll want a document that gives you all the information you need for upgrading. Luckily we have a free downloadable PDF right here at Solid Signal and you can get it right now! 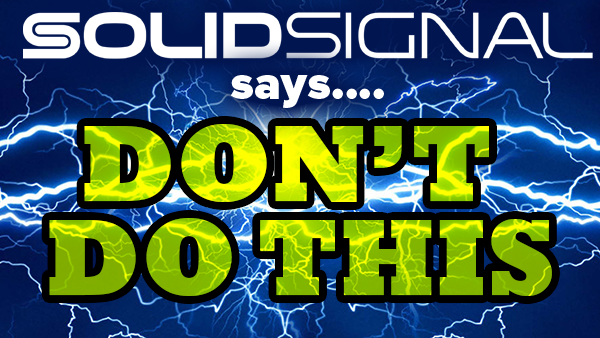 When you’re ready to buy, check out the clickable links in the PDF or simply shop at SolidSignal.com.